I have removed the posts (including mine) to prevent the thread from getting derailed as this was never my intention and I don't want to be responsible for getting this thread locked because ... of well ... forums. Hi everyone I have a problem with setting the wheel meshes during runtime. For some reason I cannot change the wheel mesh in BeginPlay or during runtime at all, there is no visible response in the viewport upon calling the function. The only place which this works is in the Construction script. Not sure if this is a bug but if someone could shed some light on this that would be amazing. I'd like to know this as well. I made sure to print debug to make sure it's casting and it's casting just fine. It runs the set command, but the mesh never changes. Need answers, please. "Hey, the wheel mesh you are setting is just used when the wheel spawns, to change it at runtime you need to access the mesh by getting the first child component of the suspension (no easier way to access it for now) and changing the mesh that way." So apparently, the "set" node I used in my previous uploaded screenshot is only for setting the mesh when the wheel spawns. I believe I found the components he's referring to in the screenshot below, but there's no way to 'set' these from what I can find. Only 'get' them. I could really use some help on this. Alright, I figured it out. I thought I'd share my findings. I sent you email, can you provide the version you submitted to epic? I'm trying to set gears at runtime and I'm running into an issue. 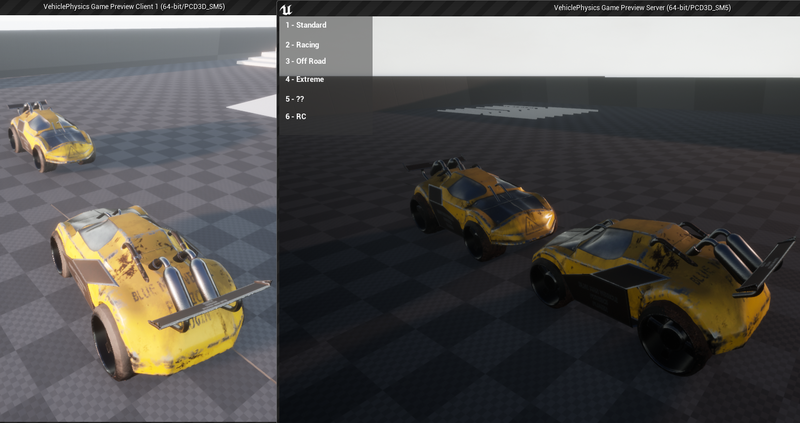 Everything sets fine and prints correctly when I debug, but the car won't shift out of 1st gear after I set the gears. Anyone have any luck doing this? Attached are my data table and function. Hey Blueman, got a issue with your VehicleAI template is there a way I can contact you,please, as tried notifying you via email and on the forum page, but havent got a reply. I've been using this plugin for over a year and I still haven't figured out what some variables do. I asked for this year ago and I still believe that a short documentation explaining what some of the features do would be appreciated, especially the vaguest like torque Transmission efficiency, Ackerman ratio etc.. It would spare you answering on emails and on this thread. That was 13 days ago ... so what is the excuse this time? I don't believe I'm the only one trying to use this plugin in multiplayer. How did you guys fix this problem?? I'm happy to announce that with the preview-code Blue Man sent me, under engine version 4.21.2 these issues have gone away. Although the behavior is in certain cases laggy and jolty, most of the time the vehicle is at the same location with the same roation on client and server, both with using listen server and dedicated server. I will keep an eye out on the weird behavior (sometimes location and roation are out of sync for one second or so) and try to bring these issues up in more detail, once the plugin is finally live on the marketplace.